On 24 January 2018, at the International Armoured Vehicles Conference in London, BAE Systems presented the next phase of development for the CV90 Infantry Fighting Vehicle (IFV) with the launch of the new CV90 MkIV. The new CV90 MkIV D-series of turrets which feature a modular design offering 30/40-, 35/50 and 120-mm main guns and weapon pods for integrated Anti-Tank Guided Missiles and machine guns. The turrets are designed to support a more extensive sensor suite integration and utilize BAE Systems’ revolutionary new iFighting concept. The MkIV generation will also be the first Western IFV with a qualified Active Protection System. 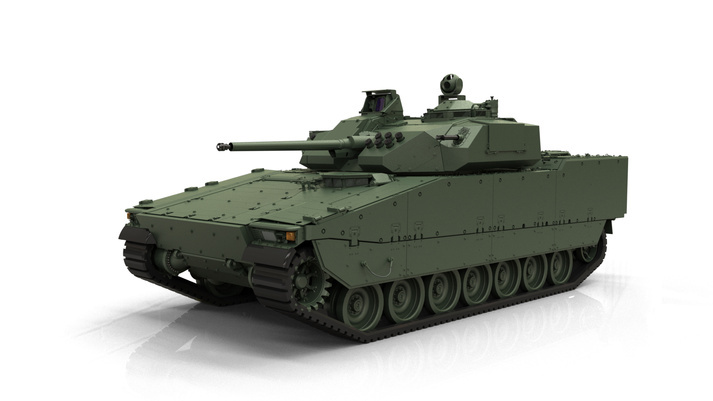 «We are proud and excited to present the next step in the development of CV90», said Tommy Gustafsson-Rask, vice president and general manager for BAE Systems’ Hägglunds business. «The MkIV will now be available to both current and future users of the CV90, who can take full advantage of this combat-proven vehicle’s ongoing development and benefit from these new capabilities. This approach provides the leading combination of a proven low-risk solution for the most modern IFV for future growth». The CV90 MkIV includes a new Scania engine with up to 1,000 horsepower/745.7 kW and the latest upgraded X300 heavy-duty transmission. The Gross Vehicle Weight Rating is increased from 35 tonnes to 37 tonnes, meaning users will benefit from two tonnes of extra payload without a decrease in vehicle agility, with the same level of protection. This gives any users an unrivalled amount of potential for future growth. The MkIV capability upgrades also enable the full implementation of BAE Systems’ iFighting concept. iFighting – or intelligent fighting – is the company’s vision for the future complex battlefield. iFighting supports the vehicle’s crew with significantly enhanced situational awareness, aiding the decision-making process. This safeguards the vigilance and the endurance of the crew, while ensuring peak performance for the whole system. iFighting achieves improved ergonomics, more advanced autonomous support, augmented reality, and the possibility of remote operation.